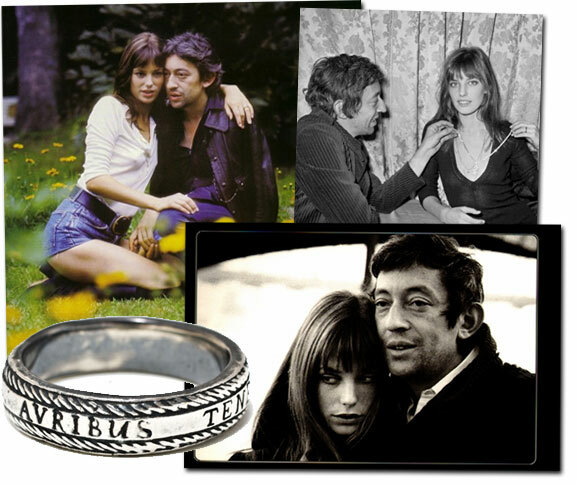 With her thicket of chestnut hair and famous wicker baskets, Birkin took the the original jolie laid wolf by the ears. One night, the wolf Gainsbourg howled ferociously. Jane responded by flinging herself into the Seine. She was fished out by two policemen, and the most famous couple in France walked home, arm in arm, madly in love. Two writers, one as bright as the Northern Star, the other a bit more modest in scope, set out for Sicily, in a house once occupied by D.H. Lawrence. 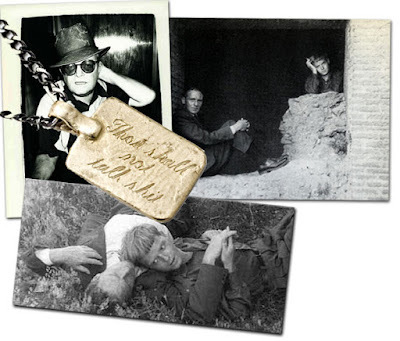 Thirty-six years later, as Capote lay dying, Jack was still by Truman's side, sort of. Not by Truman's side, were Paley, Radziwill, et al. - his estranged swans, the former intimates he had harpooned in his final, unfinished work, Answered Prayers. Dietrich hung her emerald-encrusted gold cross round the slender, stooped neck of La môme to ward away evil. 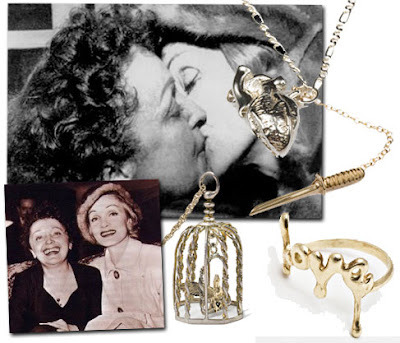 Though Evil knocked on Edith's door regardless, the Little Sparrow and The Blonde Venus were the most devoted of friends for the rest of Piaf's short life. Dietrich was fiercely protective of her drug-addled, one-time lover; a journalist, knocking on Piaf's dressing room door was answered with Dietrich's inimitable voice, "Can I help you? I am Mademoiselle Piaf's maid!" He lobbed back, "How nice. Please say hello to Miss Piaf's chauffeur, Maurice Chevalier." He wrote "Something" for her, but something wasn't everything, and she left him for a Yardbird. Before things went amiss, their love looked like beauty incarnate. 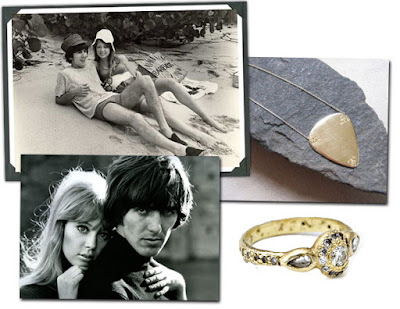 You can find Baubles for Famous Lovers (part one) here. Thank you to Leigh and Rony! p.s. This is not a sponsored post. It's just a love fest catbird and I have going. Can you blame us? i REALLY want the melting love ring. Umm, apparently you need to curate the baubles for our famous couple shoots on OnceWed. I love the ancienne ring. And I realized that it's a bit like my engagement ring, which is indeed ancienne. Thanks for being an ad free blog. That beach photo is great. I finally understand my mom's crush on him. lol.